Autumn is the perfect time to start roasting up those vegetables. 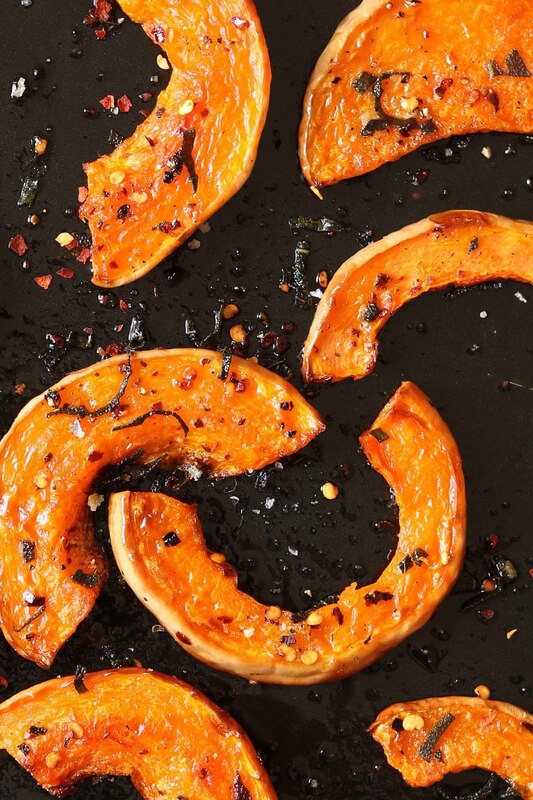 And what’s nicer on a chilly Autumn day then some sweet, roasted butternut squash? I’m not quite ready to give up my salads just yet but I am making them a little warmer and a little bit more substantial. Hey, salads can be comfort food too right? Well they can if you make this roasted butternut squash with sage and walnuts. This is a lovely warm salad perfect for lunch or dinner. So by now if you have been reading for a while you will know that we have cut way back on our meat intake. I have been doing my best to make tasty vegetarian meals for the family and so far so good. Now I am trying to add in some seriously tasty vegan recipes into our weekly meal plan, that’s where this roasted butternut squash dish comes in. This dish is sort of on the border of being comfort food, I mean, it’s warm and spicy and seriously tasty and it’s vegan. But you don’t have to be vegan to try this recipe, maybe you’re v – curious like me, or maybe you just want to try something different, then I bet you won’t even realise this is vegan. Spicy butternut squash roasted with sage is the star of this recipe, it’s sweet and spicy and warming. Whole wheat giant couscous makes this salad more substantial and with that it brings a lovely nutty flavour to balance the sweetness of the squash. Add in some lightly sautéed cavolo nero and some walnuts and you have a very tasty, balanced meal. This salad is great for lunch or dinner and meat eaters, you could use this as a side to your grilled fish or chicken. Now for the dressing, a nice sharp, shallot and mustard dressing. This dressing is on the strong side, but I think this salad needs something strong to finish it off. I used wholegrain mustard to make this, but a Dijon mustard would work well too. I also added some crispy shallots to this but they are totally optional, I just like that extra crispy texture and nutty, onion flavour they add. 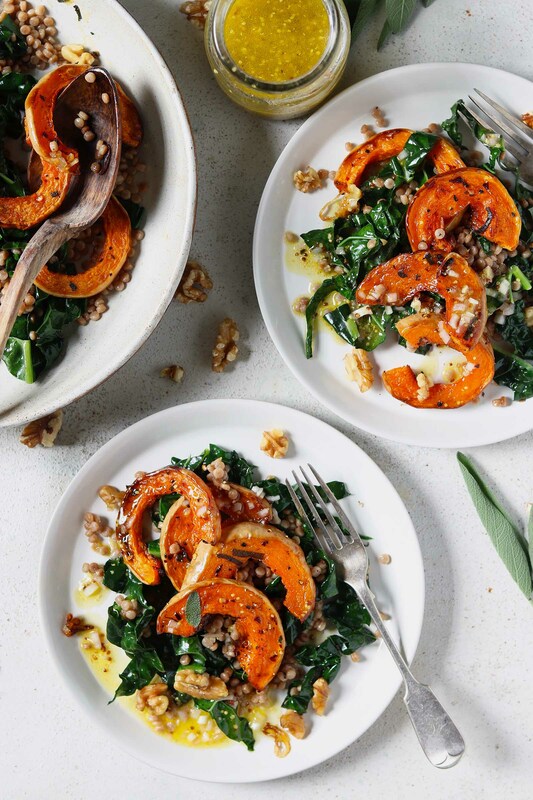 A warm salad for Autumn; spicy butternut squash roasted with sage and served with whole wheat couscous, kale, walnuts and a shallot dressing. Pre heat the oven to 200 degrees C, 392F. I use a fan assisted electric oven, please adjust according to your own oven. Use the big bottom part of the butternut squash and cut it in half, scoop out the seeds and any stringy flesh then cut into slices. Place on a baking tray, drizzle over two tablespoons of olive oil, sprinkle over the sea salt, black pepper, chilli flakes and chopped sage. Place on the middle shelf and bake for 30 minutes, turning the squash halfway through cooking. Cook the couscous according to the packet instructions. Once cooked leave to cool in a serving bowl and fluff it up with a fork before adding the remaining ingredients. Heat one tablespoon of olive oil in a skillet and sautee the kale. When the kale has turned a dark green and is soft turn off the heat and cover with a lid to keep it warm. To assemble the salad, add the kale and the walnuts to the couscous and toss. Top with the roasted butternut squash and the crispy shallots if using. You can either serve the dressing separately or add it to the dish and toss gently. I prefer to let people add their own dressing. In a jug whisk together the lemon juice, mustard, seasoning and shallots. Slowly add the extra virgin olive oil, whisking all the time. Leave in the fridge until you are ready to serve. Heat the oil in a skillet over a medium heat. Add the sliced shallot and cook for about 5 minutes until they are golden brown. Transfer to a plate lined with kitchen paper. Leave to cool and add to the salad when ready to serve. *Calories are approximate and are just for the salad. Need more Butternut Squash recipes? Try this Halloumi Salad with Butternut Squash & Quinoa or this Roast Butternut Squash & Parsnip Soup.